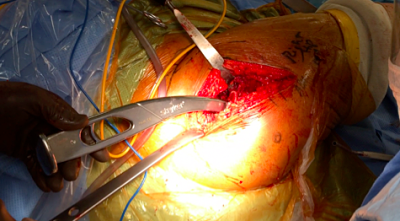 Numerous surgical approaches for total hip arthroplasty (THA) have been described. We have pursued development of an anterior-based muscle-sparing (ABMSparing) approach, with the goal of finding an exposure method that has a low incidence of complications and a short learning curve and that can be extensile if needed. Our approach provides exposure through an intramuscular plane, similar to the direct anterior approach (DA). 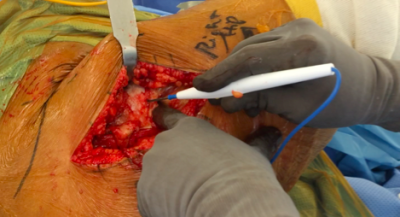 The DA approach has been reported to be associated with injury due to the limited femoral exposure, as well as wound healing problems particularly, if the hip crease is crossed. 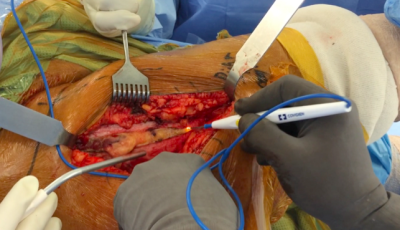 Additionally, surgeons who use the DA approach may use fluoroscopy for accurate component placement, a specifically designed operative table, and offset reamers and broaches to prepare the acetabulum and femur, respectively. The direct lateral approach has been associated with persistent abductor weakness and a limp, especially with poor healing of the released abductors. The posterior approach has been associated with the highest rate of dislocation following THA compared with other approaches. The supine ABMSparing approach is described in this case report. 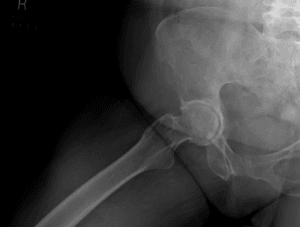 A 66-year-old female with a BMI of 35 presented with acetabular protrusio and symptomatic end-stage osteoarthritis of the right hip (Figure 1). Figure 1. 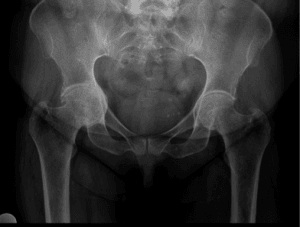 AP pelvis (left) and lateral (right) right hip radiographs demonstrating advanced osteoarthritis and acetabular protrusio. The steps in the procedure are described below and in Video 1. Video 1. Dr. Peter Sharkey describes the steps in the ABMSparing technique for total hip arthroplasty. The patient was positioned supine with an 18” x 9” x 5” gel bump under her pelvis. This bump extends the pelvis and facilitates exposure. A first assistant stood toward the patient’s head and a second assistant stood across the table. The proximal, anterior, and posterior borders of the greater trochanter were palpated and marked. A mark was made in the mid portion of the proximal femur (Figure 2). Figure 2. The hip flexion crease is marked by a solid line. The anterior superior iliac spine (ASIS) is marked by a circle. The DA approach is marked by the dotted line and the ABMSparing approach is shown laterally with hash marks and 3 dots for the greater trochanter. 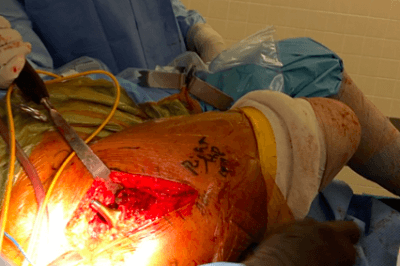 The incision was carried straight from the proximal femur, intersecting the anterior border of the greater trochanter and proximally towards the hip crease. For this approach, the incision is usually about 6 inches long, depending on adipose tissue thickness. Dissection was carried down to the deep fascia that was cleared to fully visualize the fascia (Figure 3). Hemostasis was obtained. Using a bovie, a split was made 1 cm posterior to the tensor fascia latae (TFL) border (Figure 4). The fascial split should be at least as long as the incision. A tight TFL can restrict exposure and cause excessive retraction forces, leading to muscle damage. Figure 4. The fascial split is demonstrated 1 cm posterior to the border of the tensor fascia latae (TFL). A Hibbs retractor was used to expose the junction between the gluteus medius (GM) and TFL muscles. A bovie cautery was used to define anterior edge of the GM (Figure 5). Figure 5. The TFL is under the hook of the Hibbs retractor. The left index finger is hooked under the gluteus medius. The overlying fascia is split with a bovie. 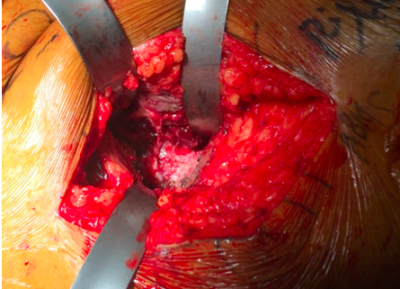 The surgeon then placed a Cobb elevator under the GM and palpated the proximal surface of the femoral neck. A curved blunt Cobra retractor was placed around the proximal neck. 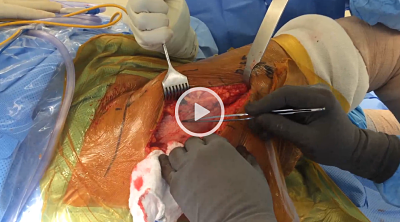 A Cobb elevator was used to clean the bursa off the hip capsule anteriorly and inferiorly. The rectus femorus muscle was lifted from the hip capsule. A second blunt Cobra retractor was wrapped around the inferior neck of the femur and a sharp Homan retractor was placed over the anterior wall of the acetabulum. A partial capsulectomy (removing the anterior capsule and one half of the superior and inferior capsule) was performed with a bovie. 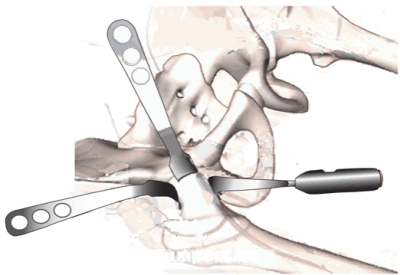 A femoral neck cut was made in situ and a corkscrew retractor was introduced into the femoral head. Retractors were then removed, and the femoral head was removed from the socket (Figure 6). Figure 6. Femoral head and neck exposure. Blunt curved Homans retractors are placed medial and lateral to the neck, with a sharp curved Hohman superior. Attention was then turned to the acetabulum. 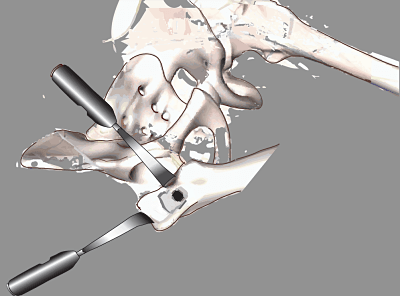 With the hip flexed 45°, a sharp Homan was inserted between the labrum and the capsule at the 12 o’clock position (anterior). 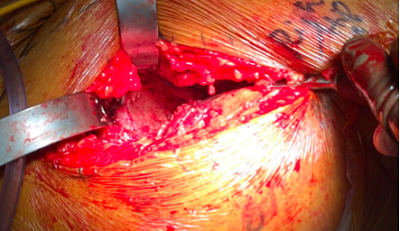 Caution is critical at this step, as the femoral neurovascular structures are juxtaposed to the retractor tip. A second sharp Homan was placed proximally to retract the GM muscle. A double-footed retractor was positioned outside the socket against the ischium (Figure 7). Figure 7. Drawing demonstrating placement of the acetabular retractors (drawing courtesy of Mr. Chor Tan). The inferior capsule was released with the 3 above retractors in place (Figure 8). Release was needed to gently retract the femur posteriorly. When releasing the inferior capsule, caution should be exercised to avoid damage to the iliopsoas tendon. Figure 8. Release of inferior capsule. 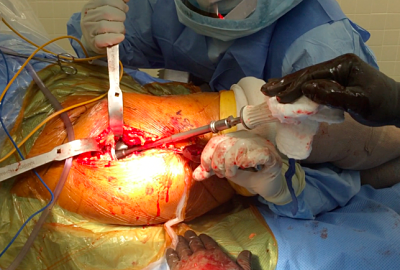 Note the position of retractors and second assistant’s arm under the femur to help lift femur posteriorly and away from acetabulum. The labrum was excised, and once the acetabulum was fully exposed, the acetabulum was reamed and the cup inserted using standard instruments (Figures 9,10). Figure 9. The reamed acetabulum. Figure 10. The supine patient position assists in accurate and reproducible cup placement. Attention was now turned to the femur. The leg was placed in a figure-4 position, with the foot of the surgical leg placed under the contralateral leg (Figure 11). Figure 11. Note the position of the leg as the femoral exposure is started. A double-footed retractor was placed between the greater trochanter and gluteal musculature. A second double-footed retractor was placed on the medial aspect of the femur at the position of the lesser trochanter. This exposed the posterior capsule, which was released using bovie cautery (Figure 12). Figure 12. 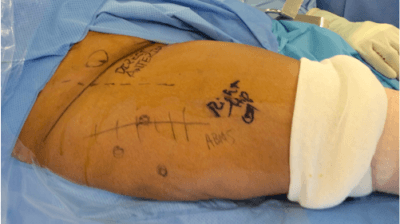 Drawing demonstrates placement of femoral retractors (drawing courtesy of Mr Chor Tan). 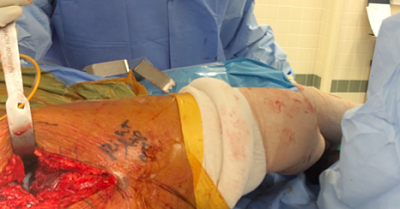 Once the capsule was released, a bone hook was used to pull the proximal femur laterally while gently pushing the distal femur medially to deliver the femur out of the wound (Figure 13). Figure 13. 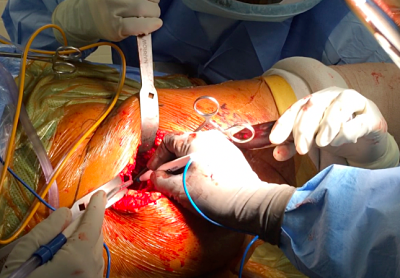 Placement of femoral retractors during femoral preparation. The femur was then prepared in standard fashion and a broach was left in place to trial leg length, range of motion, and hip stability (Figure14). Figure 14. 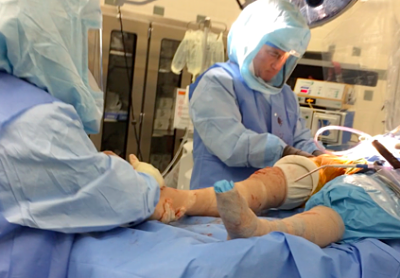 The ipsilateral foot is lifted under the contralateral knee by the second assistant to help with femoral exposure. The hip was reduced with longitudinal traction and internal rotation (Figure 15). Figure 15. The first assistant pulling traction and internal rotation while the surgeon assists in guiding the femoral head into the acetabulum. Once the leg lengths were acceptable and the hip was stable to provocative maneuvers, the final stem and head were opened and implanted (Figure 16). Figure 16. Assessment of leg length while the patient is supine. 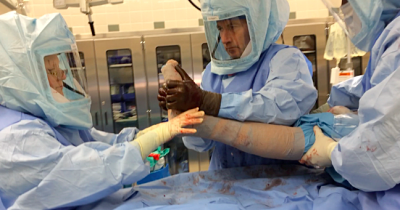 The second assistant holds the knees at a similar level, with the surgeon and the first assistant holding the calcanei together for perfect assessment of leg length. The wound was irrigated with dilute povidone-iodine, and then the fascia was tacked closed with 3 widely spaced #1 Vicryl sutures. The wound was irrigated again, this time with normal saline, and the fascia was closed with a #2 Quill (Ethicon, Somerville, New Jersey). The subcutaneous layer was closed with #1 Vicryl sutures, although #2 Vicryl can also be used, as can a #1 barbed suture and #2 followed by a #2 Quill if the subcutaneous layer is thicker. Skin adhesive was used to seal the skin. Postoperatively, the patient was not restricted in weight-bearing, and she did not have any hip precautions. She was advised that she could use a walker or cane as desired. Although multiple names have been used to describe the ABMSparing approach described in this study, it is inaccurate to characterize this approach as either anterolateral (ALMI) or modified Watson-Jones, both of which involve detachment of the abductors. The senior author has performed more than 2,000 consecutive primary THA procedures utilizing the AMBSparing approach over the past 5 years. The approach is extensile and, although rarely necessary, can be readily converted to a standard lateral approach by releasing a small portion of the GM muscle. Laura Matsen Ko, MD, is an adult reconstruction fellow at The Rothman Institute at Thomas Jefferson University Hospital, Philadelphia, Pennsylvania. Scott S. Kelley, MD, is a joint replacement surgeon with Duke Medicine, Durham, North Carolina. Peter F. Sharkey, MD, is Professor of Orthopaedic Surgery at Thomas Jefferson University Hospital, Philadelphia, Pennsylvania. He specializes in hip and knee surgery with The Rothman Institute.